This is a review of the Shield From Foes equipment for Game of War which is part of the Xenas Gear equipment set. With two large defensive combat boosts, use this item to protect your troops. Provides an excellent enemy attack debuff boost which is the best defensive boost around. 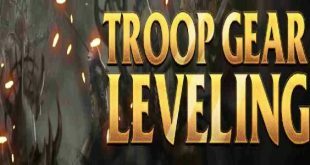 30% Troop Defense Boost is nice but only 15th overall. 3rd overall for defensive weapons but a long way behind the Damascus Steel Fire Sword and the Spear of Fire. Very useful for keeping your troops alive. At 100m silver this is item is expensive. Two standard materials are a nice inclusion. One seasonal, and one rare monster material. As with the Feathered Fortress Armor, requiring a demon tail is a killer. The only effective way to get hold of it is though Krampus chests which means lots of inferno/KvK events or big spending. The other issue is that the Feathered Fortress Armor, so if you only have one Demon Tail, use it on that instead. An excellent defensive combat item. A fair way back from the Damascus Steel Fire Sword or the Spear of Fire but still a great item. The main issue of course is the Demon Tail, and most players should use their first one on Feathered Fortress Armor.